Painting is one of the easiest and inexpensive ways to decorate your room. To make your small bedroom look calming is a challenge, and make it feel larger is quite another. Choosing the right colour is the key success to obtain calming and larger effects, light colours are ideal for making room feel bigger and certain shades can make the space feel calm and relaxing as well. 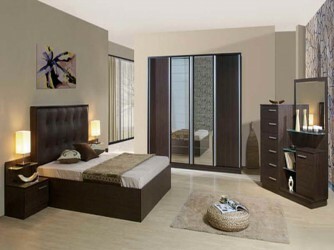 Thus, a proper selection of paint colours will allow you to retreat and relax in your small bedroom for long time. 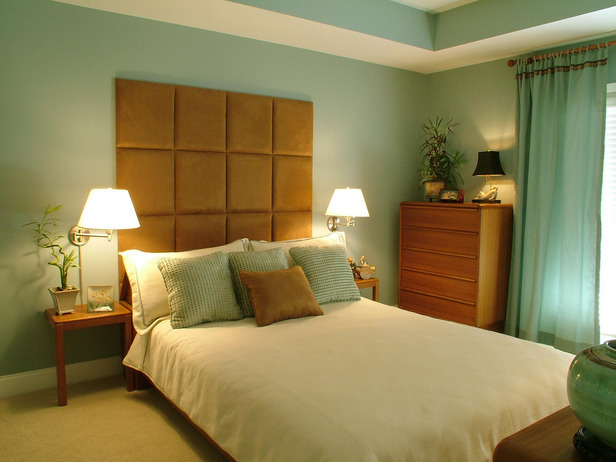 If the main purpose is to make a room feel larger, light to mid-tone shades are the way to go. Rich, saturated colours such as red or chocolate brown tend to make a room feel small and comfortable and bring the walls inward. Complete the design with final addition. Glossy surfaces reflect light, and this helps to expand the space. Blend the colours of the floor and walls by choosing colours that are within the same colour group to eliminate the contrast where they meet, making the edges of the room less defined. Choose small patterns for furniture and fabrics that blend with each other and the paint colour. Contrasting colours tend to create energetic, restful and make the room spacious. You must know that certain colours have calming effects; the key point is selecting the right shade. For instance the shade of brown. Although dark, heavy browns are calming, but can bring the walls inward in a small space. However, soft to mid-tone browns create richness, warmth and calmness, while pushing the walls back. Red-browns in particular are calming, invoking thoughts of autumn and harvest, but keep the trim and ceiling a light, bright colour to avoid making the room feel small. Soft browns also provide a neutral backdrop, which leaves you more options for furnishings. Other colour schemes that have calming effect is green. Since it is the colour of nature, you will think of growth, freshness and harmony. Green is a restful colour and invokes feelings of safety and security. Yellow-based shades such as olive create warmth, while blue-based greens like aqua invoke relaxation and calm. Both can make a room feel bigger as long as they are light to medium shades. Pair green walls with lighter ceilings and lots of light to turn the walls back and create the feeling of airiness. Blues remind us of the sky and the sea, making them calming, tranquil and serene. Pale blues also give a room a feeling of spaciousness. Pale to mid-tones are ideal for creating a soothing environment because they invoke feelings of tranquillity. Darker hues tend to be dramatic and energizing. When choosing a blue for your room, keep in mind that some shades can feel cold or bleak, so accessorize with warm colours such as yellow or red, and provide lots of light to overcome this problem. Whites and neutrals such as grey, beige, tan or cream, are always the safest colour schemes for any design. White is often associated with cleanliness, innocence and goodness. Because they are neutral, these colours can be calming, and they make a room feel larger and more airy. To add drama, while keeping things calm and spacious, add pops of colour with furnishings and fabrics.